Capcom added the icing on top of Nintendo's 3DS release date reveal by announcing a long awaited Mega Man title and more Resident Evil in 3D. Mega Man Legends is back! Capcom has announced that the third entry (not counting The Misadventures of Tron Bonne) in the cult-favorite Mega Man Legends series is not only in development, but coming to the Nintendo 3DS. In addition, Capcom has revealed a new Resident Evil for the 3D handheld called Resident Evil: The Mercenaries 3D. 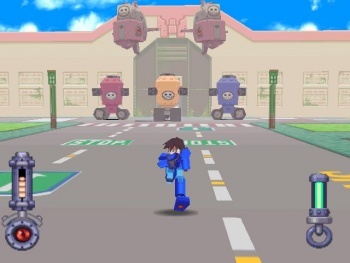 Mega Man Legends and its sequel dropped the traditionally 2D Mega Man into a 3D world gave it the gameplay style of an action-RPG. The series was very different than what Capcom had done with the series previously, but had remained in limbo until now due to what were seen as weak sales. Keiji Inafune has referred to it as one of his favorite versions of Mega Man and has been chomping at the bit to bring it back to life. The game will be called the Mega Man Legends 3 Project, and all Capcom has revealed about it is that "fans will have an opportunity to be part of the development process like never before as they interact directly with the team." Keiji Inafune says Capcom is using a "new style of development" for the title, and that he "wants to make a game for you." Capcom is being very mysterious about it right now, but more information will be released at the New York Comic Con which takes place from October 8-10. Legends 3 along with Mega Man Universe seem to indicate a desire to stray from the typical kinds of Mega Man games that have been released in the past. As for Resident Evil: The Mercenaries 3D, it'll feature the mercenaries missions from Resident Evil 4 and Resident Evil 5, but now they'll be in 3D. Resident Evil's mercenaries missions typically give players a time limit to defeat as many enemies as possible and/or complete other goals while running through a particular environment. Capcom says The Mercenaries 3D will also add new modes and familiar new characters. The best part is that players will also be able to team-up to play the game cooperatively through Wi-Fi anywhere in the world. Along with Resident Evil: Revelations, Capcom now has two Resident Evil titles in development for the 3DS . Neither game has a release date yet, so it's unsure if Mega Man Legends 3 or Resident Evil: The Mercenaries 3D will be launch titles for the 3DS. If so, and players somehow have an involvement in the development of Legends 3, Capcom better get moving because the 3DS launch is only five months away.